Ontario Premier Daulton McGuinty's budget needs to be voted on because the Liberals have a minority government. Tim Hudak's leader of the Progressive Conservative Party has already stated he will vote no. This leaves the NDP and their leader Andrea Horwath the ability of either passing the budget or voting against the budget which would trigger a provincial election. She is also in a position to negotiate some changes in the budget, a budget which includes the ending of the slots deal with racetracks in Ontario. Unfortunately, politics isn't about doing what is right. It is mostly about who will give you the most donations in the future, paying back those who donated in the past, and making decisions based on the current status of one's party with an eye towards more power and seats in the future. Oh, and the odd dirty deal where some money slide under the table to the politician. The NDP really gained during the fall election, winning 17 seats. They still came in third. They would not be expected to even come close to a majority if they forced another election. Popularity for the Liberal Party has dropped significantly since the election, which means that the PC could possibly win with a majority. They would definitely beat the Liberals now that the Liberals have alienated the horse racing industry couple with the public's knowledge regarding ORNGE. But a PC victory isn't good for the NDP's objectives, as they are to the left of the Liberal Party, which is left to the PC Party. However, putting the PC's in charge might be a decent gamble for the NDP going forward, banking on the PC's to screw up so that the NDP would have a shot of winning the following Provincial election (but I don't think they thinking like that). The other factor to consider is the cost of the election. Both the PC's and the NDP are still in the hole from the fall election. This definitely is something that will hold Horwath back from causing an election within the next two months. Horwath has been inundated with calls from the racetrack community since stating she will listen to the public regarding whether to vote yay or nay for the budget. But I'm pretty sure the decision has been as long as she can make it look like she won something through negotiations with the Liberals prior to the vote. It would be great if one of the concessions would be a continuation of the racetrack slots deal until at least 2015. Though this is unlikely because the Liberals seem to have their heart set on mindlessly destroying the horse racing industry in Ontario. I'll get to that in my next post. There will be a horse racing season at Fort Erie this year. Beyond that, the prospects are not very good without outside help. Grossly unfair as it was, slots from the track will be pulled at the end next month, barring a very unlikely decision reversal by the OLG. The OLG has assured that the expected payments of what would have been if the slots were in place, would still be paid to the track this year. However, as it is right now, next year, Fort Erie is on its own. Fort Erie is in big trouble if it has to fend for itself. From various sources and using extrapolation, a ballpark figure on what it costs to run a track for a season can be guesstimated. For the past three seasons (including 2012), thanks to the negotiations of the EDTC with the government, Fort Erie was able to receive $5.6 million instead of the $2.9 million they were only supposed to get a year from slot operations. Purse accounts received $2.9 million from slots as well, which represents 10% of the slots revenues at Fort Erie. The Town of Fort Erie also pitched in as well from part of their municipality share of slots to try to keep the track at a break even level, as did the HBPA. Fort Erie does give out around $100,000 a day in purses, which means that around $4 million must be generated by wagering. This also means that the track makes around $3.5-$4 million from wagering. Nordic Gaming, the company that owns the track, leased it out to the EDTC the past 3 years, and in return received $100,000 in 2010, and $600,000 last year and this year. In total, if Fort Erie to run a 75 day season in 2012, it appears to need more than $10 million to operate. Though the EDTC does not pay staff inside the casino, I imagine they will be able to cut some jobs that might be related to the casino from outside of it. In Ontario right now there are two thoroughbred tracks. Woodbine is home to large purses, and owners who pay big bucks to keep horses in training. Fort Erie is Woodbine's minor league affiliate. If a horse can't compete on polytrack or can't compete for $10,000 claiming or greater, they generally wind up at Fort Erie. Sometimes horses are given up on too early, or improve enough, and the might wind up back at Woodbine, and there are quite a few horses that toggle between the two tracks. The existence of a B track is very important to most Ontario owners and breeders. The owners need an out that is simple. If the out for an owner of a horse who isn't cutting it at Woodbine is to ship to the US (which requires finding and trusting a new outfit miles and miles away in most cases), or trying to quickly get rid of the horse (which could, unfortunately, mean sell for meat), the owner will quickly become disillusioned, and most small owners and partnerships will either drastically reduce exposure or get out of the game completely. This is not good news for breeders who need as many owners in the game to keep the demand for horses as high as possible. Many small owners also breed, without a B track, they will disappear as well. From Woodbine's standpoint, with fewer owners and fewer horses, they will have a very difficult time filling races over as the years go on, and that is going to be very bad when it comes to their betting handle. Woodbine is trying to become a recognized A track but will resemble Penn National instead. Could Woodbine run a bunch of $5,000 claimers? Even if they wanted to, I doubt it. At $80-$100 in day pay rates, owners are not about to hang onto those horses even if they could get stalls at Woodbine. And those who might be able to pay Fort Erie rates ($45-$60 a day) while racing off a farm or training center, will quickly learn that they will be at a serious disadvantage running against horses dropping from $12,500 who have been training at Woodbine. How about Ajax taking over as the B track location? They did build a five eighth oval, but unless they can house around 500 horses minimum in their backstretch (which they can't right now), it just won't work, for reasons cited above. There would be too much of a disadvantage and overall hassle if too many owners need to ship from anything but a racetrack. Fort Erie is the perfect locale for a B track and it just doesn't make much sense not to have it around. 1. If nothing else changes, a shortened season with maybe 35-40 race dates might be in the cards. If expenses to run the tracks can be cut down to around $4-$5 million this is a definite possibility. But a shortened season means even fewer outfits will be attracted to stable at Fort Erie, and also may not be enough of an out for the Woodbine based owners and outfits. This will probably create shorter fields at both Woodbine and Fort Erie. 2. A new owner willing to gamble (or Nordic willing gamble...unlikely) that they can make a go of it by cutting expenses and focusing on horse racing handle, that they can make Fort Erie close to profitable. This is a long shot on the surface, and it might be appealing to someone with lots of money to lose who just wants to own a racetrack. 3. The OLG and Ontario government has stated that they are looking to privatize slots in the short term. However, Fort Erie wasn't even given the opportunity because of its proximity to the Niagara Casinos. The fact that Fort Erie is a different municipality than Niagara makes this move by the OLG even more unpalatable. I'm not a lawyer, but the move by the OLG has anti-trust written all over it, and if the OLG goes the privatization route at racetracks, I believe that Fort Erie should be given the opportunity to run their own slots. At this time, the OLG hasn't even hinted at what the new cut would be (they used to get 75% of slots revenues, but had to cover all the casino expenses. They receive 20% of gross revenues at the Caesar's at Windsor which the OLG does not operate and pay casino expenses, and Caesar's operators lost money even with that deal last year). Depending on Fort Erie's ability to get back slots and what the new deal would be makes this scenario a possibility that has some hope. 4. An actual government subsidy to keep Fort Erie alive. The loss of slots jobs will be devastating enough to all businesses in the Fort Erie area, but loss of the track will turn Fort Erie into a ghost town. Whether this gives the Ontario government reason to step in, in light of their mandate to reduce the deficit, is up in the air, and something I wouldn't bank on. Small help from the HBPA will most likely happen if needed. 5. Woodbine's future is also unclear. They are perceived to know more than what they are saying, but that might just be a perception. Do they know what the new cut will be, do they know they are getting expanded casino gambling? Or will they get a much lighter cut than they are getting right now, and with the OLG getting into internet gambling soon, how much cannibalization will there be on current and future casino customers? Whether they realize the importance of a B track now or not, they eventually will. And if no other option keeps Fort Erie alive next year, they might just step in and lease the track or even buy it back and operate it knowing they will most likely lose some money. One thing track closures do for Woodbine is it increase their "home market" for HPI where they don't have to split betting commissions with tracks that close. If Fort Erie goes under, or if Woodbine ends up leasing or owning the track, they wind up with a full market of over 450,000 residents in the Fort Erie home market. A market that really hasn't been advertised probably because it isn't that profitable with a split....but without a split, it would be worth Woodbine's efforts most likely. Bottom line, because there is a lot of overlap in Horsemen operations between Woodbine and Fort Erie and factoring in more betting revenues, it might not be that difficult for Woodbine to run a break even operation at Fort Erie in an effort to maintain Ontario's current level of thoroughbred racing and breeding and horse ownership. 6. In a worst case scenario, Fort Erie revenues will now be totally dependent on what it makes on customers betting horses. The EDTC has not shown that they understand the Horseplayer yet. They did drop takeout on the Pick 4 last year to 17.3% (something that increased handle on that bet), but their total handle dropped 17%, which was much higher than the industry drop in 2010. There has been a shift in the mentality of the Horseplayer lately. They've become more informed. Many are cognizant of track takeout. Takeout on doubles and exactors at Fort Erie is over 26%. There are most likely many who will not even look at Fort Erie because of that. Then there is the churn factor and its psychological effects. Slots works because they have a payout of around 90-93%. Players last, and even think they are winning when they are not...or at least think they are close to winning. The longer they last, the more they want to come back, the more likely they are to go more and expose more friends and family to their game. The same is true of horse racing, and even if it means paying out an extra $2 or $3 a day, that money will wind up back in the windows. At 26%, whether the player knows it or not, they have no chance of even thinking the game is somewhat beatable. Fort Erie must reduce takeout on exactors and doubles to 21% absolutely tops (Woodbine charges 20.5% for these two wagers). If that is something that Fort Erie management can't rationalize on its own, how about bringing in rolling doubles to make up for any deficit they think they might overcome (though I strongly believe that without having to resort to expanding the wagering menu, just dropping the exactor and double takeout will have a very positive effect on both handle and bottom line for the Fort Erie track). Barring a bad reduction in field size, on track handle should rise just because slots are no longer available at The Fort. The reality is almost $30 million was lost by "gamblers" at the slots in Fort Erie last year. Though Horseplayers and slot players are generally not the same person, there is some overlap and couple that with the racetrack now being the only game in town (OK, Fort Erie does have a Bingo Hall), it can be expected that at least some of the $30 million will now be lost betting on ponies. How much is the big question. But it doesn't have to be a huge percentage to fill in the gap that slots is leaving. track, and this includes simulcast wagering too. Believe it or not, I don't think that something like this is totally impossible. Even if they can capture another $20 million churn, it would help prospects for next year immensely. But attracting churn means lowering the takeout, and paying real odds on simulcast races despite whatever takeout the other tracks have (it really pisses off players when they get less than the real payoff is). Fort Erie needs to get with the mentality that it isn't a crime to let players leave with money in their pockets. They won't get cannibalized by slots when it comes to that money, and a player that leaves with money is a lot more likely to come back. Are The OLG and Liberal Government Flying By The Seat Of Their Pants? This modernization plan by the Ontario Liberal government and the OLG is starting to remind me of a Jackie Mason monologue: Do you know whats going on with slots and the racetracks? I don't know but someone else must. Where can I find this someone else? Start with Dalton McGuinty, he seems to know most of what needs to be known. But does he know everything? Not everything, maybe the OLG knows everything. They don't seem to know everything either. I think they thought they knew everything, but they don't know everything anymore. How about Finance Minister Dwight Duncan? He seemed to know everything too, but he doesn't know everything now, except maybe when it comes to donuts. To make sense of the above, we'll have to look at some real information and real laws that are now coming out of the woodwork. First, in my previous post, I stated that slots were taken away rather quickly from Fort Erie, Hiawatha and Windsor race tracks because it is the OLG's goal to sell the nearby casinos, so by taking away the slots from the tracks, the bottom line revenues for the casinos would go up making them more attractive to buyers. Looks like I was wrong as it is illegal for a private company to both own/lease and operate a casino in Ontario according the Criminal Code of Canada, unless exceptions are made. Exceptions are not a gimme when there is a minority government whose popularity has shrunk since getting elected only 5 months ago. These laws throw a monkey wrench when it comes to the idea that racetracks can have privatized gaming. The racetrack right now owns the property that the OLG is leasing from them. If a racetrack or even another business were to take over the operations on the tracks, that would mean that the OLG is neither leasing, owning or operating the casino. This is against the Criminal Code, unless a loophole exists that they can get away with just leasing gambling equipment to make it a go. So in Fort Erie's case, lets say that the $30 million in revenues a year caused a break even for the OLG after operating expenses and the amounts paid out to the track, horsemen and municipality. Even if $5 million of that makes its way over to Niagara Falls, that is $5 million more bottom line for the OLG and the operators of the Niagara casinos. Now by taking away the slots without giving a privatization option to these border tracks, the province and OLG have declared these tracks as nothing but competition. And I'm sure they are hoping the tracks close down completely so that if any gambling is done, it will be on OLG product. It sounds slimy, but heck we are talking about McGuinty here. The biggest news that came out today is that McGuinty has stated that Municipalities can hold referendums when it comes to introducing new casinos (like in Toronto). Well, according the OLG Act of 1999, a referendum MUST be held. With the recent poll that shows 60% of Torontonians against a new casino, the likelihood of a yes is far from a sure thing. Unless, those bottom dwelling Liberals can pass new legislation regarding a referendum having to be held (and I wouldn't it put it past them). In fact, the way the laws are written now when it comes to bringing in a new casino, there are quite a few hoops to jump through. It appears right now that the Liberals and OLG have written a check their asses can't cash. Who knows, maybe they'll decide to leave well enough alone. For the racing industry, its many direct employees, and the many businesses these employees support or help support, one can only hope. UPDATE: McGuinty has said that the provision to have a mandatory referendum has lapsed. So that means McGuinty has one less hoop to jump through. He can bully a new casino through in Toronto now, and even if the majority of Torontonians want a referendum, politicians can do what they do best and lie or come up with an excuse for not having to do a referendum. Bottom line, no one has even mentioned what the split will be on the new privatization deal, and this reinforces my belief that there isn't a person who knows everything yet. For my American readers who might be confusing Ontario or Canadian Liberal Parties with political liberals in the USA, every political party in Canada is to the Left of the US Democratic Party. The Federal Conservatives and the Ontario Progressive Conservatives are to the right in the Canadian political spectrum, with the Liberal Party on the Left, and the New Democratic Party closer to the Far Left. Personally, I'm a social liberal (by American standards), while fiscally I'm close to the centre (center in American language). One final note: Kim Craitor, the Liberal representative for the Niagara Region (including Fort Erie) has had threats against his life and now fears to set foot in Fort Erie. Craitor, took a lot of credit (whether he deserved it or not) when a deal was made to save racing at Fort Erie three years ago, but he was nowhere in sight when an OLG gunslinger came to town last week to take away the keys to the slot machines at the track. Politicians don't need to have their life jeopardized (besides the fact that one can get jailed for doing the threatening). You get even with them by voting them out. The Drummond Report came out recommending that the Ontario government revisits the slots deal it has with racetracks. It didn't take long for Dalton (Norman Bates) McGuinty and his sidekick Dwight (Have Another Donut) Duncan to start lying about the relationship between racetracks and slots (calling slots revenues tax dollars and stating they were subsidies to the tracks) and then hinting that racetracks may lose all or some of their slots revenues. In what seems the time it took to read the Drummond Report, border Racinos in Fort Erie, Hiawatha, and Windsor were told that their slots were going to be eliminated by April 30th this year, but that the government will make sure tracks are able to operate and purses accounts will be (close to) maintained for another year as long as these tracks race. Of course, more lies were used by the collective PR of the OLG and Ontario Liberal Party, stating these Racinos were losing money. Revenues are way down, but the only track that is close to break even is Fort Erie, and it is doubtful that the OLG was losing a dime there. OK, so the macro reason for the slots closures has to do with the budget, or so they claim. But why close them so quickly? Because the main agenda item is to prop up the revenues for the 4 stand alone casinos (Niagara has two) that are very close to proximity to the 3 Racinos that had the slots taken away. The goal by the government is to sell these casinos (before online gambling erodes these numbers down again), and the reality is that these casinos actually do lose money. The fact that the government is paying lots of severance to slots employees and lots of money to the three tracks for the lost slots revenues over the next year shows that immediate deficit reduction is what this move is all about, nor is it about changing the ratio of what tracks get to keep on slots revenues. In fact, the government has made it clear that it wants to privatize all slots and casino operations within the next year or so, which means that the OLG will not have to worry about paying slots employees, maintaining machines, etc. The gaming operator will now take over that function. The question again is what will the new cut be if a track takes over the operation, and what will be the deal with expanded slots as well as online gaming which is expected in the near future. The government is attempting to get out of paying for the expenses of gambling, and they are looking to sell their assets (by the way, someone should clue in Puppet Progressive Conservative leader Tim Hudak that what he wants is what the government is looking to do). This isn't really what the Drummond Report said to do, but this is the new direction the government is taking. Let gambling competition run amok, and tax the gambling company as much as it can (without having no gambling companies interested in doing business with an untrustworthy government in Ontario). Hudak meanwhile, is not getting the big picture. The government is looking to put slots anywhere and everywhere, which means that Fort Erie and the other tracks should have had the opportunity to keep them. But the selling of the casinos is the reason they were taken away abruptly. I wonder if Fort Erie, Hiawatha, and Windsor have a legal case by having their rights denied to compete to have slots, and the way in which this was done (especially if it turns out that the other tracks will be given the choice to operate slots). Down the road, once the government decides what their new cut is going to be on slots and how and for what price they will sell the location rights, the rest of the tracks that have slots will make their decision as to whether to operate or not. Once the Niagara Falls casinos as well as those in Windsor and near Sarnia are sold, Fort Erie may have the opportunity to buy the rights to operate slots, unless part of the sale of the casinos will have a clause that no other gambling operations can be put up within a 25 mile radius, for example. I have to say though, Duncan, McGuinty, and Paul Godfrey make me sick with their lies and misrepresentations. Hudak, if he wasn't so clueless and wasn't so badly managed, could have been the Ontario leader right now, and one thing is for sure, this wouldn't be going down like it is right now. I also believe that there would be no closures either, nor would racing be destined to die at any location in the near future either. The next stage in the game for the Ontario Liberal Party and OLG is to believe they are entitled to have gamblers gamble with them. It won't work as long as they maintain their Pro-Line odds mentality. See "Is Horse Racing in Ontario the Fall Guy For Government Mismanagement?" Note: The photo above is circulating on Facebook (where I happened to come across it). McGuinty has pissed off quite a few people. Even I find the message a bit harsh but decided it fit in well with the blog piece. The mystery of how the Ontario government plans to change the revenue sharing arrangement it has with Ontario racetracks was solved to some degree yesterday as the OLG dropped the bomb on the horse racing industry, announcing that the partnership between tracks and government slots would end a year from now. The exact plan (which tracks are tabled to close, what the new revenue sharing deals will look like, etc.) was not addressed yesterday. Trying to make the most sense out of what the government plans to do moving forward, it looks like municipalities will be given the power to allocate x amount of gambling product and devices within its borders. Private companies will then bid for the product. In the case of a racino, the owner of the track will have the ability to operate the slots. The way it works right now is that the OLG rents the slots room from the tracks. The OLG pays for employees, machines, maintenance, and renovations. This comes out of the 75% of revenues the OLG keeps. The way it will work in the future (I'm taking an educated guess here) is that tracks will have to pay all the expenses the OLG pays for now. The biggest question is what will the cut be? Right now, probably the weakest slots facility (other than the stand alone casinos that are losing money) is Fort Erie. According to OLG statistics for the year ending March 31, 2011, Fort Erie revenues (money lost by customers betting on slots) was $29.8 million. Total payroll for their 225 slots employees was $12 million. Horsemen received $2.98 million to enhance purses. However, the government signed a different 3 year deal, allowing Fort Erie the ability to try to get their house in order, by giving the track $5.35 million in lieu of the $2.98 million they were supposed to receive as the 10% share of slots revenues. The Town of Fort Erie also receives around a million and a half each year as well. That leaves around $8 million under the current arrangement less maintenance expenses, which probably makes Fort Erie a break even proposition when it is all said and done, from the OLG's perspective. It can be estimated that Fort Erie racetrack also generated between $9 and $10 million in revenues from gambling and concessions. Around half that money goes to the purse account. Nordic Gaming, the owner of Fort Erie Racetrack, has claimed that the cost to operate the track is around $8.5 million a year. This is why an enhanced slots deal was needed in the first place. But Nordic was in no position to negotiate such a deal, so a leasing agreement was arranged with the Fort Erie EDTC who successfully got the subsidy from the government. The one distasteful thing about the deal is that Nordic was actually paid over $1.3 million the past three years for just sitting back and watching even though there was no way Nordic was going to see any profit if this deal never occurred. OK, so why rehash all this? Going forward, there is no more agreement between tracks and horsemen regarding slots (assuming tracks will be given the option to keep slots). What does that mean for Fort Erie? If ownership doesn't change, it is a 99% probability that racing will cease there. What about slots? Again, we are back to the mystery of what the new revenue sharing arrangement will look like. Average payroll for the province is around 11.0% of total revenues for racinos, payroll percentages increase in a big way (over 30%) when table games are introduced (more employees per table, security, etc.). Maintenance and renovations too have to be factored in, in order to attract outside businesses (or existing racetracks) to bid for casinos. So lets say the government takes 50% of gross revenues. For Nordic, that would mean that the government would take $14.5 million of the $29 million that gamblers lose. The municipality will still expect 5% or so. However their current payroll is very high (especially compared with other racinos), and if that stays at $12 million, when factoring in maintenance, buying the machines, and renovation expenses, breaking even will be very difficult (especially when online gambling comes into the picture). There is another factor too, much of slots revenue occurs because a track is there, as spouses may split up at the track, with one going to the slots portion and the other staying in the grandstand, as well as the fact that some of those who play slots received some of their play money from revenues generated via horse racing. In other words, expect slots revenues to decrease somewhat. With all the above factored in, Fort Erie slots and racing looks doomed, and with real estate prices depressed (thanks to those who rely on racing and slots to sell their homes), the price tag for the track as a real estate item will be minuscule. It makes me really scratch my head when it comes to the rationalization that this master plan by the government is really going to raise revenues to the province. The fact is that the stand alone casinos lose money, and they only relinquish 20% of total revenues to the province. Why would a private business be interested in getting into the casino business in Ontario, especially with online gambling looming. Most people who want to gamble in Ontario have no problem anyway. Locating slots elsewhere at a lower cut will not wind up gaining more revenues for the government. Nor will putting lottery machines in more places (as far as I'm concerned, they are everywhere already). Having more machines will not lead to Ontario residents losing more money on lotteries. Table games, outside of major casinos, are not huge net revenue generators because of costs involved. The only thing I agree with, is that when it comes to online gambling, the Ontario government is losing out some potential offshore revenues. However, in order to get that back, it needs to compete head to head with them, and that means paying out exactly what the offshores payout. This is not what the government does when it comes to Pro Line. And if they partner up with a Betfair, for example, their share of revenues will not be worth the direct addiction they will now be responsible for. The deal the government has with the tracks right now is a guaranteed money maker, and to me, the government will need to reduce their own split in order to attract others to take over, and when it comes to land based revenues, Ontario residents are losing most likely what they are going to lose no matter how much expansion there is. In the meantime, the government will devastate jobs, families and rural real estate prices, in their foolish quest to try to get more Ontarians addicted to gambling. Give yourself your best chance to beat the ponies by wagering at HORSEPLAYERSBET.COM. HORSEPLAYERSBET.COM is 100% Parimutuel. FREE LIVE VIDEO AND REPLAYS. WATCH UP TO 4 LIVE FEEDS AT ONCE. PLAYER REWARDS are added daily into active accounts. 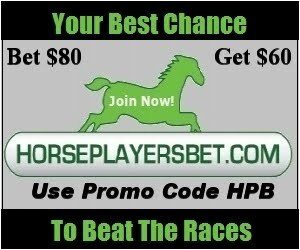 HORSEPLAYERSBET.COM: "WHERE HORSEPLAYERS COME FIRST"